What if Socrates never had to take poison? What if Cleopatra never fell in love with Mark Anthony? What if colonialism never happened? Those are some of the questions Darb 1718’s second “Something Else — Off Biennale” promotional material asks. 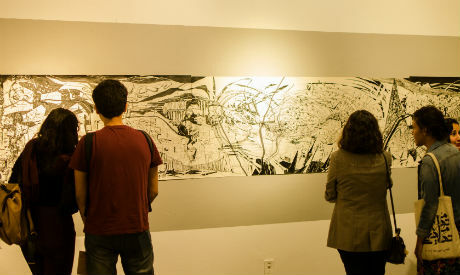 The large-scale event (1 November-15 December) has visual art as its basis, with curator Simon Njami working with several international supporting curators as well as Darb’s founding director, the artist Moataz Nasreldin, to fill the halls of Darb 1718 and other Downtown Cairo venues with the work of 90 (including 23 Egyptian) artists from all over the world. In a kind of fringe segment, activities extend to cultural centres, embassies and old abandoned shops, with another 10 participants at least, including musicians and performers as well as artists. Njami gave the artists a question to ponder: “What if it did not happen?” His purpose? Urging them to imagine a different world, one that differs in social, political, environmental, racial or gender terms. Indeed, the title “Something Else” stresses the event’s unique character as rather more than a display of contemporary art works, however multinational or large. The Off Biennale also includes talks, workshops, panel discussions, film screenings and over 10 performances, and it partners with the Balassi Institute, the Goethe Institute and others. In this context it showcases art practices from different continents, let alone countries, and providing a truly remarkable opportunity to be close to the dynamics and vocabulary, the dreams and directions of contemporary art. As we take in the show, not only do we gain access to contemporary art and the people behind it, examining works that combine different mediums as tools of expression, we are also invited to take a deeper look at life, civilisation and the gains and losses of human kind; we reassess centuries of history and the positioning of humans in history’s ever-changing checkerboard of social, economic, political and environmental factors. Some works are direct, some cry out for attention, others send subtler messages. The dreams and fears, hopes lost and found emerge in the exhibition rooms as artists tackle the theme of “what if it did not happen”, with thought experiments as varied as “what if the Chernobyl disaster did not happen”, “what if humans had a different form”, “what if hieroglyphs did not fall out of use”. Often, figuring out the answer is the task of the viewer. Njami’s question opens the door to various ideas and conjectures, from open-ended, vague imaginings to precisely detailed takes on current issues. Njami embraces creative minds from various generations and with all kinds of baggage, giving them borderless, unlimited freedom. For the Egyptian art scene it is a great opportunity to see an event by such a leading figure on the international curatorial scene. Born in 1962, Njami is a writer, lecturer and art critic as well as an independent curator; he has a remarkable portfolio of written works and an equally impressive record of large exhibitions and biennales, many with a focus on Africa (he was repeatedly in charge of Bamako Encounters, Biennale d’Art contemporain de Dakar, among many others). 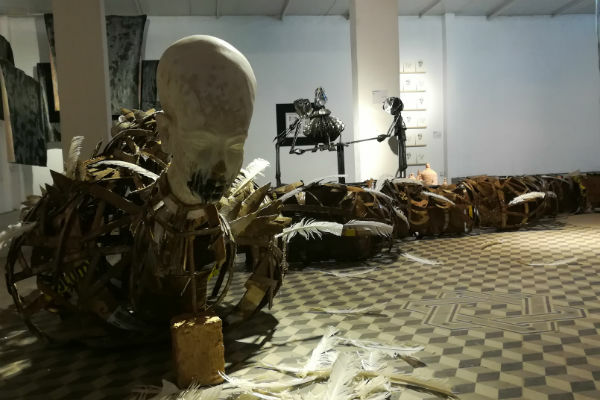 Undeniably, his presence in Cairo through the period of the Off Biennale is one of the most important artistic events in Egypt in 2018 and the credit definitely goes to Nasreldin for making it possible. 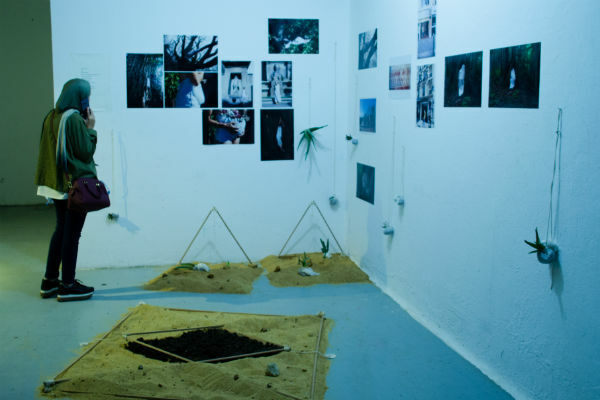 Unlike other biyearly, large-scale art events, which serve as a point of revision and reassessment and a source of knowledge of contemporary practices, the Off Biennale not only supplements the traditional format with fringe exhibitions and extra activities but also responds to Egypt’s very specific landscape. The country’s two biennales — held since the 1950s in Cairo and Alexandria — were both discontinued as of the 2011 Revolution. 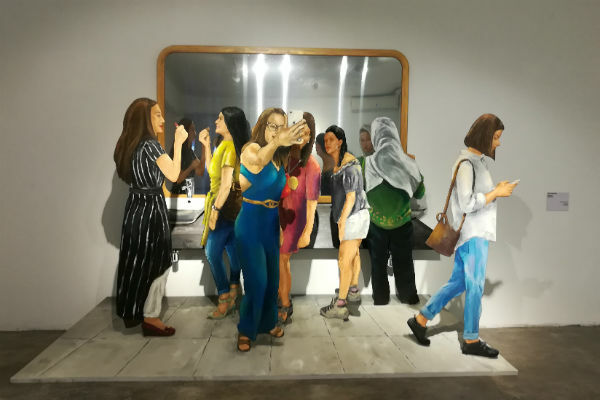 The Alexandria Biennale was revived in 2015, but it was limited to 17 artists from 13 countries all within the Fine Arts Museum, and it had many financial and operational problems. Salah Al-Meligui, then head of the Culture Ministry’s Fine Arts Sector, hoped to revive the Cairo Biennale in 2016, but none of his successors has carried out the plan. Since 2011, however, the two events — and, mostly, their absence — have raised questions about quality and the effect of politics on art. “I thought this cannot be the end and decided to step in with an alternative, independently managed event. We launched the Off Biennale in 2015 as the ‘Off event’ of the Cairo Biennale, which in fact no longer existed,” but this hardly mattered since it was more of a concept than an actual pairing. The operations of the Off Biennale follow international structures, inviting a curatorial team working under a head curator to bring practices from across the globe to one location, generating dialogue and networking. It departs from the outdated bureaucratic procedure through which the Culture Ministry biennales gathered work, according to Nasreldin: contacting the embassies of the countries to be featured, which then addressed the relevant government authorities asking for work to be featured. Darb, by contrast, works with numerous bodies and cultural players, and relies on internationally acknowledged curators to make the best choices, supporting both artists and curators as it does. When Nasreldin repeated the experience, this was not without its own problems. “Among the many obstacles we faced was the financial side. 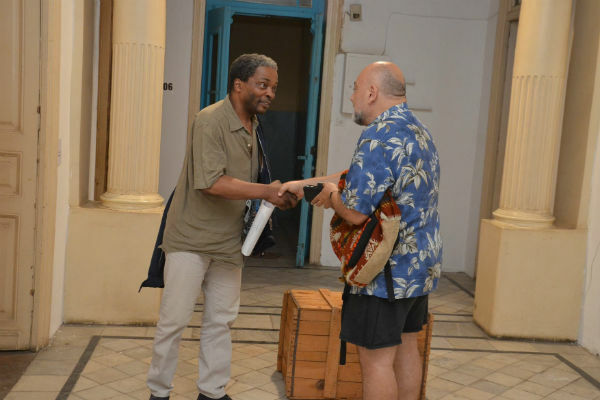 Though numerous businessmen agreed to support the Off Biennale, they all eventually reneged on their promise,” something of which 2015 Alexandria Biennale organisers also complained, “and we had no choice but to continue working with Darb 1718’s own funds. Of course I mustn’t forget to mention support received from Al Ismaelia company who gave us Downtown spaces free of charge, Scib who contributed the wall paints, embassies and cultural centres which hosted performances or supported the artists invited, among other organisations. It meant cheaper lighting and projection solutions, among other technical issues. Nasreldin salutes both the volunteers helping with this year’s Off Biennale and “the amazing team I have in Darb 1718: just 12 people who carry this huge event on their soldiers. I couldn’t wish for better, more passionate or more dedicated workmates”. His assessment of the organisation is C+, but however self-deprecating he wants to be the success of the event — in terms of its importance, the values it carries and the extent to which it is spread across venues, practices, mediums, artists and curators — is beyond question. The first of three openings — on 1, 2 and 3 November — drew over 3,000 people and countless media outlets, including the event’s 10 partners. The hype is remarkable, and it is wholly positive in that it is enabling and promoting exposure, exchange and dialogue. This is precisely the mission of the Off Biennale, and living up to it makes it one of the most important art events in Egypt today. It was probably in response to the Off Biennale, Nasreldin says, that the ministry announced plans for a Cairo Biennale revival in April 2019. “I’m not sure how realistic such plans can be, taking into account the very late date. Any biennale requires long and detailed preparation, a professional curator, supporting curators, a proper infrastructure, among many other elements. “Nevertheless, if this happens, whenever it does happen, we’ll work with the Cairo Biennale, adding to and not competing with it. We are all here to support the country’s art scene,” he concludes.